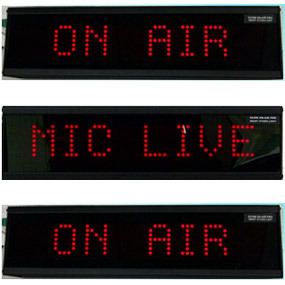 ECOM ON-AIR PRO smart studio light is a compact and efficient annunciating display, ideal for Radio Stations, Recording Studios, TV Stations and radio control rooms etc. The light can display static messages or moving messages (if larger than the approx. 8 characters) using high intensity LED light arrays providing optimal visibility in most indoor environmental light conditions. The ECOM ON-AIR PRO can display up to 8 pre-programmed messages using the control panel provided along with the smart studio light. The customer can request customs messages at the time of the order. The messages are displayed either as static characters (if text is less than 8 characters) or as scrolling text for longer text messages.